Three Skomorokhi, the talented entertainers of the Kievan Rus, are depicted performing their art. 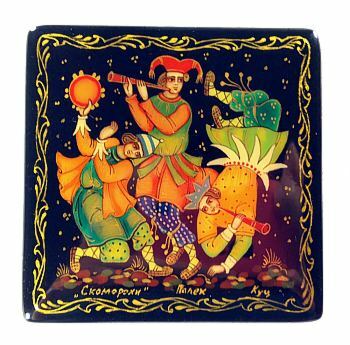 The playful artisans of amusement are dancing and playing joyfully, their bright orange, red, and green garments creating a crisp contrast against the black background. Elegant golden ornament surrounds the scene, and another one decorates the sides of the box. The box is made from papier mache. It sits flat (no legs) and has a hinge at the top. The interior is red. Signed with the name of the artist, village, and composition.